The Mingei International Museum, located in Balboa Park in San Diego, California, will host the “Discover Mingei” treasure hunt on 30 January, as the North County Times reports. Families will receive a treasure map that they can use to find hidden art treasures while exploring the museum’s collection. Prizes will be awarded to those who finish the hunt. 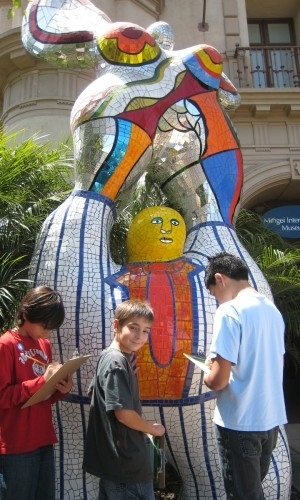 Here, three boys participating in a previous “Discover Mingei” scavenger hunt visit a sculpture by Niki de Saint Phalle outside the Mingei International Museum. The treasure hunt ($5 per family, $3 for singles) will take place from noon to 4 p.m. in Balboa Park, 1439 El Prado, San Diego, California. Visit the Mingei International Museum web site. Die Werke von Niki de Saint Phalle brauchen viel Raum und sollen diesen im erweiterten Sprengel Museum bekommen. Doch noch fehlen für den Ausbau knapp zwei Millionen Euro an Drittmitteln. In den sechziger und siebziger Jahren war Mitmachkunst besonders gefragt. Das Publikum sollte in Kunstaktionen einbezogen werden. 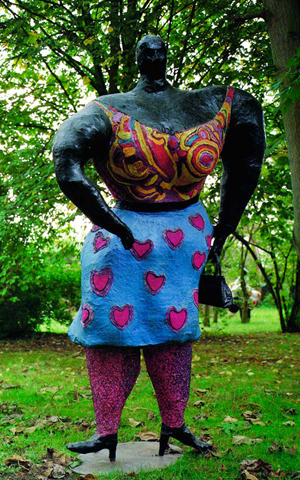 Niki de Saint Phalle schuf als eine der wenigen Frauen in der damals noch stark männerdominierten Kunstwelt eindringliche Beispiele für Mitmachkunst, zum Beispiel ihr heute im Sprengel Museum Hannover befindliches Werk aus Hemd, Krawatte und einer Dartsscheibe mit dem vielsagenden Titel „Heiliger Sebastian oder Porträt meines Liebhabers“ von 1961. Das Publikum war aufgerufen, mit Pfeilen auf die Figur zu zielen – und tat das auch ausgiebig. Aus dieser Phase stammt auch „Der Tod des Patriarchen“. Auch an der Figur aus Gips mit eingelegtem Kinderspielzeug – Gewehren, Soldatenpüppchen, Cowboys und kleinen Flugzeugen – durfte sich das Publikum abreagieren. Entsprechend mitgenommen sieht der Patriarchenstellvertreter heute aus. Freilich ist das Werk inzwischen eine Ikone der feministischen Kunst der Sechziger. Die genannten „Schießbilder“ kamen im Jahr 2000 im Zuge der großzügigen Schenkung von Niki de Saint Phalle nach Hannover. Mit dem Einzug der Werke von Niki de Saint Phalle vor zehn Jahren wurde es endgültig eng im Sprengel Museum. Rund 400 Werke der populären Mutter der Nanas umfasst die Schenkung. Die großzügige Donation machte das hannoversche Museum auf einen Schlag zum wichtigsten Ort für die Kunst der 2002 verstorbenen Frankoamerikanerin. Freilich stellten die zum Teil sperrigen Dinge aus Materialien wie Gips, Stoff oder Maschendraht das Haus auch vor Probleme – Platz- und Konservierungsprobleme. Aus heutiger Sicht mögen solche Ab­reaktionsaktionen etwas plakativ erscheinen – oder gar als terroristische Phantasien ausgelegt werden. Unbestritten aber kommt Niki de Saint Phalle das Verdienst zu, sich als eine der wenigen Frauen in der Kunst der sechziger Jahre eine Stellung erkämpft zu haben. Und so wird heute vor allem ihrem Frühwerk eine Schlüsselrolle in der emanzipatorischen und feministischen Kunst zuerkannt. Das Sprengel Museum kann den Stellenwert der Kunstrebellin mit einer Fülle von Werken belegen. Es besitzt auch den Originalschießanzug und das Gewehr der bildschönen Gräfin mit dem Karabiner. 2012 beginnen die Arbeiten am 25 Millionen Euro teuren Erweiterungsbau. Derzeit fehlen noch knapp zwei Millionen Euro an Drittmitteln. Informationen zur Sponsoring-Kampagne „Mehr Museum“ gibt es unter www.mehr-museum-de. JANUARY 23, 2011  NEW YORK: The US section of the International Association of Art Critics/AICA-USA announces its annual awards to honor artists, curators, museums, galleries and other cultural institutions in recognition of excellence in the conception and realization of exhibitions. The winning projects were nominated and voted on by the 400 active members to honor outstanding exhibitions of the previous season (June 2009-June 2010). The 26 winners of first and second places in twelve categories, selected from over one hundred finalists, include exhibitions focusing on contemporary artists Marina Abramović, Tino Seghal and Cai Guo-Qiang, the mid-20th century artists Arshile Gorky and Yves Klein and the 19th-century and early 20th-century masters Henri Matisse, Otto Dix and Claude Monet, as well as thematic exhibitions dealing with the presence of women artists in pop art, history of performance art, and the Bauhaus. Awards will be presented by a group of distinguished curators and artists, the former winners of AICA Awards, among them Chuck Close, Christo, and Martin Puryear. The Lila Acheson Wallace Professor of Modern Art at the Institute of Fine Arts/New York University Linda Nochlin will present the Special Award to Elizabeth C. Baker. Artistic component of the evening will include screening of a video by William Kentridge. Eleanor Heartney and Marek Bartelik will serve as MCs for the evening. This year’s Nominating Committee included: Eleanor Heartney (Chair), Marek Bartelik (AICA-USA President), Rachel Wolff (AICA-USA Vice-President), Barbara MacAdam (AICA-USA Board), Debra B. Balken, Michael Duncan, and Jeanne Claire van Ryzin. The awards ceremony, which has been held annually for more than 25 years, will take place at the Cooper Union for the Advancement of Science and Art on March 14, 2011 at 6 p.m. Awards will be presented by a group of distinguished artists and curators. Elizabeth C. Baker will be honored with a special Award for Distinguished Contribution to the Field of Criticism. Museum curators, artists and critics from around the country are expected to attend. A select number of seats will be available to the public. Members of the public may contact aicausaprogram@gmail.com for more information about attending the event. The group exhibition “Seductive Subversion: Women Pop Artists 1958-1968” has been chosen as Best Thematic Show Nationally for 2010 by the U.S. section of the International Art Critics Association (AICA). The critically acclaimed show, which includes works by Niki de Saint Phalle and 21 other artists, was conceived and organized by Sid Sachs, director of exhibitions at the University of the Arts in Philadelphia. “Seductive Subversion” examines the impact of women artists on the traditionally male-dominated field of Pop art  reconsidering the narrow definition of the Pop art movement, reevaluating its critical reception, and expanding the canon to reflect more accurately the women working internationally during this period. “Seductive Subversion” opened on 27 January at the Tufts University Art Gallery after earning critical praise in its previous venues  the University of the Arts in Philadelphia, the Sheldon Museum of Art in Lincoln, Nebraska, and the Brooklyn Museum of Art in New York. The award will be presented on March 14 in New York at the AICA awards ceremony. MEDFORD, MA, 19 JANUARY 2011 – The Tufts University Art Gallery is proud to present the major, large-scale exhibition Seductive Subversion: Women Pop Artists, 1958-1968 in its Tisch Family and Koppelman Galleries and Remis Sculpture Court from January 27 to April 3. Seductive Subversion examines the impact of women artists on the traditionally male-dominated field of Pop art. It reconsiders the narrow definition of the Pop art movement and reevaluates its critical reception. In recovering important female artists, the show expands the canon to reflect more accurately the women working internationally during this period. The exhibition features 70 artworks by 22 artists. Some of these artists experimented with then-new, industrial materials such as Plexiglas, plastics, rubber, and neon to create unique works of art that responded to the effects of mass-production. Others subverted domestic skills they had learned as young girls to create the first “soft sculpture” using fabrics, plastics, and other found materials that deployed a craft aesthetic as high art. Others appropriated from mass culture, including Hollywood film, advertising, publicity photos, and commercial publishing to critique emergent popular culture and male fantasies about female desire. An eponymous 248-page hard-bound publication, co-edited by Sid Sachs and Kalliopi Minoudaki, with essays by Bradford Collins, Kalliopi Minioudaki, Patty Mucha, Linda Nochlin, Annika Ôhrner, Martha Rosler, Sid Sachs, and Sue Tate is available; price is $50 plus shipping and handling. Please contact: Hannah Swartz, 617-627-3094 or hannah.swartz@tufts.edu to request a copy. Originally organized by the Rosenwald-Wolf Gallery of The University of the Arts, Philadelphia, and curated by Sid Sachs, additional curatorial contributions to the exhibition have been made by Catherine Morris, Curator of the Elizabeth A. Sackler Center for Feminist Art, Brooklyn Museum. The Tufts presentation has been organized by Amy Ingrid Schlegel, director of galleries and collections at Tufts University. This project has been funded by The Pew Center for Arts & Heritage through the Philadelphia Exhibitions Initiative with additional support from the Marketing Innovation Program. This project was also supported by the Andy Warhol Foundation for the Visual Arts. At Tufts, this presentation is made possible in part by the Kenneth A. Aidekman Family Foundation and Edward S. Merrin. Artists Included in Seductive Subversion: Eveylne Axell (1935-1972); Pauline Boty (1938-1966); Vija Celmins (b. 1938); Chryssa (b. 1933); Niki de Saint Phalle (1932-2002); Rosalyn Drexler (b. 1926); Letty Eisenhauer (b. 1935); Dorothy Grebenak (1913-1990); Jann Haworth (b. 1942); Dorothy Iannone (b. 1933); Kiki Kogelnik (1935- 1997); Kay Kurt (b. 1944); Yayoi Kusama (b. 1929); Lee Lozano (1930-1999); Marisol (b. 1930); Mara McAfee (1929-1984); Barbro Östlihn (1930-1995); Faith Ringgold (b. 1930); Martha Rosler (b. 1943); Marjorie Strider (b. 1934); Idelle Weber (b. 1932); Joyce Wieland (1931-1998); May Wilson (1905-1986). Image: Martha Rosler, Woman Vacuuming Pop Art, 1966‐72, Photomontage, 24 x 20 inches; Courtesy of the Artist and Mitchell‐Innes & Nash, New York; copyright the artist. The Tufts University Art Gallery animates the intellectual life of the greater university community through exhibitions and programs exploring new, global perspectives on art and on art discourse. The Gallery is fully accessible and admission is free ($3 suggested donation). Gallery hours are Tuesday through Sunday, 11:00am to 5:00pm & Thursdays until 8:00pm. Free event parking is available in the lot behind the Aidekman Arts Center, off Lower Campus Road. During regular visitor hours, there are free visitor parking spots in the Gallery parking lot. February 3, 5:30 to 8 p.m.
With curator Sid Sachs (University of the Arts), in dialogue with TUAG Director Amy Schlegel. February 10, 6:30 to 7:30 p.m.
March 31, 6:30 to 7:30 p.m.
A dynamic, discussion-based approach to directed looking at art. Knowledge of art is not required. February 24, 6 to 8 p.m.
Panelists: Kalliopi Minoudaki, art historian and publication co-editor; Catherine Morris, curator (Elizabeth A. Sackler Center for Feminist Art, Brooklyn Museum) Idelle Weber, artist. Co-sponsored by the Women’s Studies Program, Women’s Center, and Africana Center; panelists TBA. The Tufts University Art Gallery has announced that the major exhibition Seductive Subversion: Women Pop Artists, 1958-1968 will be on exhibit in its Tisch Family and Koppelman Galleries and Remis Sculpture Court from 27 January to 3 April 2011. The critically acclaimed show, which includes works by Niki de Saint Phalle and 21 other artists, was conceived and organized by Sid Sachs, director of exhibitions at the University of the Arts in Philadelphia. The exhibition features 70 artworks by 22 artists. Learn more. In March, Bechtler Museum unveils major exhibit by “Firebird” creator Niki de Saint Phalle on The Green. 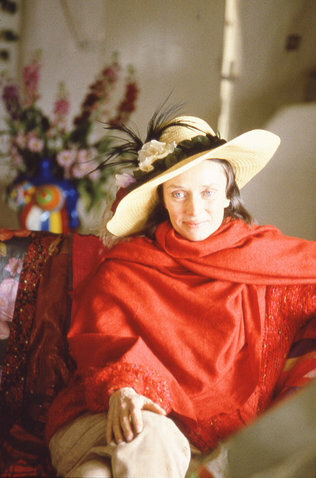 Niki de Saint Phalle was a prodigious artist whose curiosity led her to dig into cultures from all over the world and create huge and colorful works reflecting what she learned. Her popular “Firebird” in front of the Bechtler Museum of Modern Art uptown is one of the thousands of pieces she produced. Soon, it will have company. From March through October, five large sculptures by the French-born artist will fill The Green, the Wells Fargo-owned park across South Tryon Street from the Bechtler. Most prominent among them: “La Cabeza,” a representation of a skull in green, yellow and red that weighs six tons and is large enough for people to crawl inside. 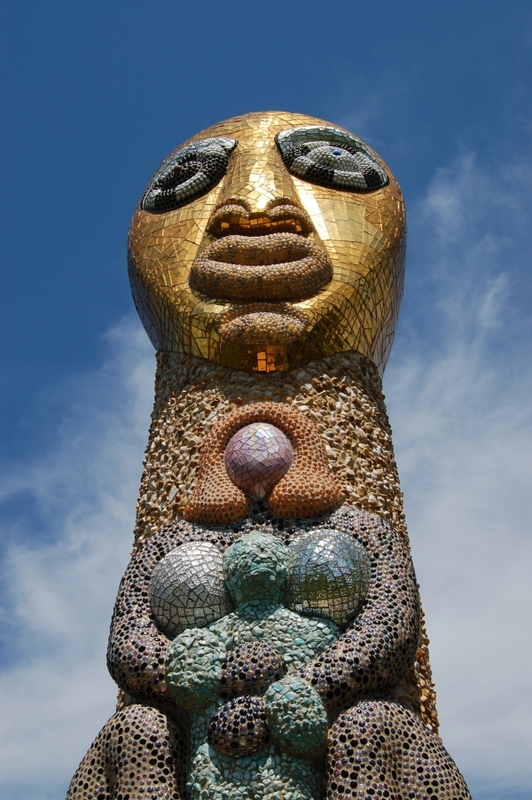 For “Niki de Saint Phalle: Creation of a New Mythology,” the largest outdoor sculpture exhibit the city has seen, the Bechtler also will show about 60 additional works in its fourth-floor gallery. “The interest and affection demonstrated for the ‘Firebird’ strongly suggests there will be a large and strong audience for the exhibit,” said John Boyer, president of the Bechtler. An internationally known artist, Saint Phalle was born in France, educated in the United States and lived in San Diego for the last decades of her life. Her work is well-represented at the Bechtler. An exhibit of her work, Boyer said, is part of the museum’s mission to interpret its collection. Future shows likely will look at other artists in the museum’s holdings such as Alberto Giacometti and Joan Miro. Andreas Bechtler, the retired Charlotte businessman whose gift of his family’s 20th- century art helped found the museum, knew Saint Phalle. He also was close to Jean Tinguely, an artist with works in the collection who was married to her. The sculptures will be on loan from the Niki Charitable Art Foundation in California. Works will be placed so as not to interfere with events on The Green such as Shakespeare in the Park. Two works will be oriented to the Levine Center for the Arts on Tryon, and two works will be situated nearer the convention center on College Street. The fifth work will be in the center. Bob Bertges, the Wells Fargo vice president who oversaw construction of the cultural campus, said the bank did a structural analysis on where to place the heavy sculptures over the parking beneath The Green. A fashion model in her youth, Saint Phalle became a self-taught experimental artist whose work reflected her energy and curiosity. She once made paintings by firing a rifle at bags of paint attached to a canvas. She was an early exponent of Pop Art and the use of feminist themes. She also had “a voracious appetite for the cultures, religions, myths and legends from around the globe and looked for ways to absorb and reinterpret them,” said Boyer. The sculptures draw on Egyptian, Greek and pre-Colombian stories. The works in the museum will include paintings, prints and sculpture, most from her foundation’s collection. The artist also sought to create a new mythology with a series on Black Heroes. 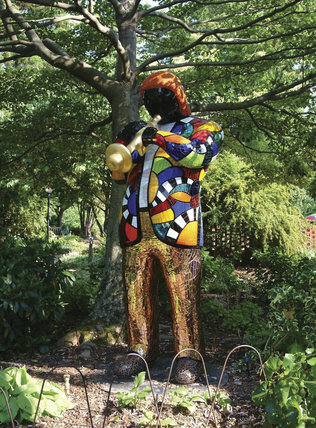 Her “Miles Davis” (1999), a depiction of the famous jazz musician with a multicolored coat and gold-like trumpet, will face College Street. The other works for The Green are “Star Fountain” (1999), “Cat” (1999) and “Golf Player” (2001). Saint Phalle liked her work outdoors, creating sculpture gardens in Tuscany in Italy, Jerusalem and San Diego. She liked the idea of interaction. During a well-attended 2008 exhibit of Saint Phalle’s work at the Missouri Botanical Garden in St. Louis, children especially loved “La Cabeza,” said Lynn Kerkemeyer, the garden’s exhibits manager. “The kids couldn’t keep off of it,” she said. When Andreas Becthler bought the 18-foot tall “Firebird,” which is covered with mirrored glass, he wanted not just an iconic piece, but also one people would enjoy. For Saint Phalle, who died in 2002 in California at age 71, joy was always part of her art. You heard it here first! Unless, of course, you happen to have seen the Charlotte Observer story on “Niki de Saint Phalle: Creation of a New Mythology,” the upcoming exhibition at the Bechtler Museum of Modern Art. The Bechtler is already home to a fine collection of works by Niki de Saint Phalle and Jean Tinguely, including Niki’s popular Firebird (a.k.a. Le grand oiseau de feu sur l’arche), now on permanent public display in front of the museum. For the show (“the largest outdoor sculpture exhibit the city has seen,” says Maschal), the Bechtler also will show about 60 additional works in its fourth-floor gallery. Watch this space (and read Maschal’s story) for more about this exciting exhibition. All too often in the course of human evolution, the ground marked for rebirth is scarred by tragedy. This was certainly the case with feminist art at the dawning of the 21st century. The opening of the Brooklyn Museum of Art’s Elizabeth A. Sackler Center for Feminist Art on March 23, 2007 provided ground for new hope. The inaugural exhibition Global Feminisms was curated by Linda Nochlin, whose seminal essay “Why Have There Been No Great Women Artists?” spearheaded a new room in the ivory tower that would eventually steer the postmodern dialectic, celebrated at a 2001 Princeton conference I attended on the 30th anniversary of the essay’s 1971 publication in ArtNews. Was this true? Could the black walls surrounding the triangular shaped table of The Dinner Party represent a dead womb, a hermetically sealed timeline that had come to an end? Were the stars of the feminist movement upholding the status quo, thereby preventing the arising of new stars in the feminist galaxy? What hope then lay for the future of women artists? It seemed that Millett was prophetic, for her proclamation was born out on the eve of the Winter Solstice 2008 by the suicide of the brilliant and beautiful Emma Bee Bernstein, who carried the pedigree, along with the hope for feminist’s future. The tragic death of this prominent third generation feminist daughter sent a chill through the New York feminist/avant-garde establishment. Where was the meaning in the face of a new feminist generation who wowed the audience at a BMA panel killing herself on the darkest night of the year inside the Peggy Guggenheim Museum in Venice? No one dared ventured a guess. Seductive Subversion: Women Pop Artists 1958-1968 signifies a rebirth that delivers us to a place where we can place such a tragedy in the context of shifting paradigms. The exhibition stands as the most timely and groundbreaking in New York City this fall for its excavation of a repressed history that Emma Bee Bernstein was digging into by way of her isolated personal/public examination of the precarious realm between fashion and art. The exhibition claims for feminism iconic female figures whose Promethean spark brought them brief fame before sinking into the shadows of Pop Art’s slick surfaces. The Venezuelan native Marisol Escobar (whose given name evokes the marriage of masculine (Sol = sun) and feminine (mar = sea) was prescient of the androgynous spirit of the inspired Pop Princess that lighted the stage for a brief moment, before the men  as usual  took over the movement. The founder of British Pop was Pauline Boty, the vibrant artist who embodied the mod style of London’s 1965 Youthquake: rebellious, beautiful, brilliant and free-spirited. Boty’s seductively subversive multimedia (poet, risqué dancer, radio show host, actress) expression exuded the spirit of the androgynous Aquarian archetype that continues to infiltrate the collective consciousness via the antics of tabloid celebrities, even as the authentic rebellion driving this zeitgeist has been institutionally repressed by the art world system. Far from revealing the full story of these fascinating women  an impossible task to be sure due to the difficulties of locating the work  who often were collaborators with their male partners, the exhibition seduces and entices into a new diverse view of feminism founded in a daring penetration into the gender archetypes controlling human behavior. In leaving a hunger for more, it plants the seeds for a new epoch of feminism marked by a younger generation of artists exploring mythologies of freedom delivering on the feminist promise of an authentic equality of gender. The lack of a feminist consciousness also meant a lack of self-consciousness. This alone makes the ingredients of Seductive Subversion fresh and new, despite being executed nearly a half century ago. And too, the work reveals that the nature of the feminine is to be fluid, which means not retaining a fixed identity that the still male-dominated art world deems essential for success  the self-branding currently being brandished via reality TV. How do artists devoted to inner truth get around this obstacle? Catalog co-editor Kalliopi Minioudaki’s standout essay “Pop Proto-Feminisms: Beyond the Paradox of the Woman Pop Artist” brings to light what may prove to be the most pertinent feminist scholarship of this century. By examining the diverse strategies in what she terms “proto-feminist” art, this new generation of feminist scholar provides a link between the artists of the early sixties she has excavated and such latter day anomalies as Carolee Schneemann, Tracey Emin and Francesca Woodman. The dismissal of such spirited art as narcissistic by second wave feminist scholars (I witnessed this personally at the Princeton Conference when a prominent feminist scholar stated: “I distrust the inward: it smacks of narcissism.”) has effectively censored a younger generation of artists from inner exploration. The irresistible seduction of these “proto-feminist” pioneers on view in Brooklyn through January 9 (though the exhibit will be going on tour) not only succeeds in making the underpinnings of a historical movement come alive again, but inspires a new erotically charged Pop movement liberated from the feminist straightjacket and devoted to the mythology of an authentic liberation of gender equality, within and without. Isn’t the public ready and waiting for the flowering of an archetype which poked through in the sixties cultural revolution only to burrow underground for the next half-century? This time, the promise is a full liberation, an authentic merging of public/private revealed by the archival documents in this exhibition into a new view of the feminine: pro-active in all her androgynous power. From this viewpoint, we can address the question about women artists and greatness not by comparing woman artists in this exhibition to the male giants of Pop, but by revisiting the word “greatness” from the viewpoint of a holistic paradigm. Let us not forget here that women are the authentic image-makers for a culture. So if the art of Seductive Subversion seems to be echoing that of much more prominent male artists, you can bet that these women got there first! Photo 1: Niki de Saint Phalle’s Black Rosy is an iconic work representing the shadow of Eros that would be repressed by feminist criticism in the years to come. Photo 2: Niki de Saint Phalle’s My Heart Belongs to Marcel Duchamp (1963) reveals the complex inner feminine emotions that would soon be repressed by feminist dogma. 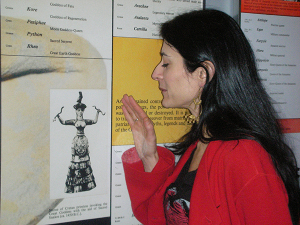 Photo 3: Kalliopi Minioudaki with her Cretan ancestry on the timeline in the Sackler Center for Feminist Art. 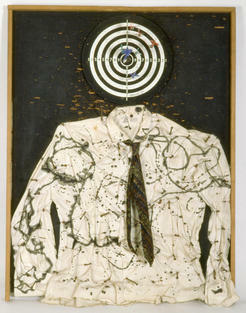 The exhibition featured Niki de Saint Phalle’s My Heart Belongs to Marcel Duchamp (1963, shown here) and Black Rosy (1965). Read the entire article.